The Beatles Through The Years: Thursday Thought: "Where Is Paul McCartney's Original Hofner Bass?" Thursday Thought: "Where Is Paul McCartney's Original Hofner Bass?" Today's thought, on Thanksgiving in the USA, is the location of Paul McCartney's Hofner bass, his original 500/1 that he bought in Germany in 1961 and played until mid 1963 when Hofner gave him an updated model. This is the one he still uses in concert today. After that, it was stolen during sessions for Let It Be. Who knows where it is now? I imagine it is in someone's attic or hanging on the wall of a guitar shop somewhere waiting for an eagle eyed Beatle fan to walk in and spot it. In the case of John Lennon's Gibson J-160E, it was found and sold for 2.4m at auction not too long ago. Will we see Paul's bass turn up soon? 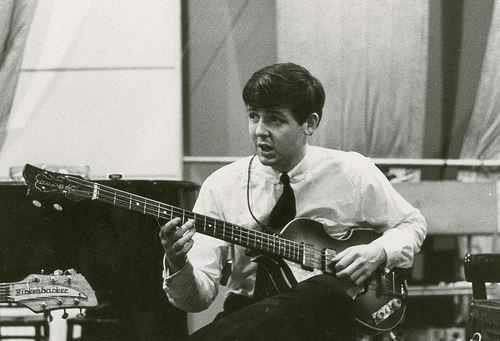 Where is Paul's Original Hofner Bass?? ?